Earn $0.98 in VIP credit (98 points)What's This? Available in 700c and 650c sizes, Michelin A1/B1 Aircomp Tubes are a great choice for both competitive riding and training. Featuring an ultralight butyl rubber compound, these tubes deliver fantastic results for all riders. 700c x 18-23mm, 700c x 18-25c or 650c x 18/23mm, with 40mm, 52mm, or 60mm smooth valve stems. 75 grams (700c x 18/23mm, 40mm valve). A mere five grams heavier than Michelin's high-performance latex tubes! I have been using these tubes for 3 years. I like them Alot. They are lighter than a regular butyl tube and hold air just fine. I check my tire pressure Everytime I ride but there have been a few time the sat overnight and they are fine for a couple days. Very pleased with my tube purchase and use. Great value and longevity for a light bike tube. Best tube on the market. Durable, lightweight for a butyl tube, all stem lengths, reliable. The only tube I use for all five of my road bikes. These tubes are probably the best available. I've used others that have deflated while just sitting in my car. No such issues with these. Great tube! Terrific service! My 1 source for bike products. Great tubes! Terrific service! My 1 source for bike products. Good lightweight tube. I always buy 18-23 sz for my 28 wide tires. Excellent tubes, light as it says! Quality, I see it in this product. I am a more light weight rider at less than 140lbs so saving a few ounces here and there does go a long way. I could feel a difference with these tubes over cheaper alternatives. I did not see or feel anything negative...these tubes are all good! Possibly the worst piece of cycling equipment I have owned. This is possibly the worst piece of cycling equipment I have ever owned. Everyone of these tubes have leaked from the stem valve brand new out of the box. Save your money and buy a tube with more durable stem valve. 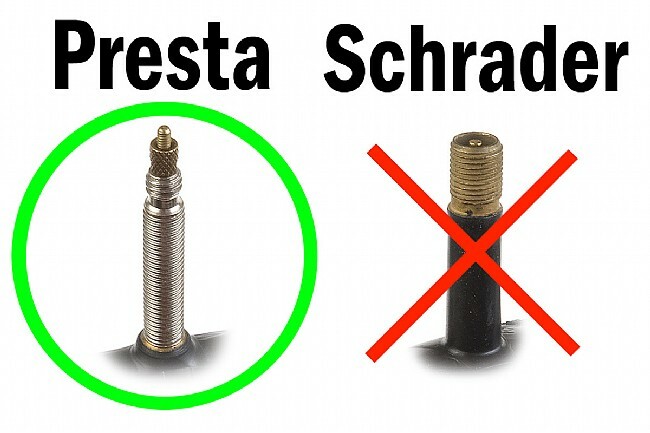 Its no fun being stranding great distances from home because the stem valves in this product are faulty. Shame on Michelin for manufacturing such crap!!! Needed long valve stem and lightweight tubes for a set of aero clincher wheels. These do the job well and fold small enough to fit easily into my seat bag. Valve stem is smooth so it does not chew up my pump head and valve core is removable. Great tubes that seem very durable. No problems with valves or installation. One of the only brands with a solid (non threaded) shank. Does not wear out the pump seals so your pump will last longer! Durable, light and with smooth valve stem, the best tube over all. I run the lightest front and rear tires available so makes sense to use the best butul tube. Nothing I don't like about it. Thinner and more supple than the average tube, but it seems tough. I changed two bikes from Kenda tubes to the Aircomp to get a lighter more supple tube. Running Pro4 Endurance tires with these so the tube is well protected. After just over 1,000 miles I have had no issues, even with tiny nicks starting to show in the tires, and some very rough riding on beaten roads and some gravel down in So Cal. They do feel better and getting rid of weight at the rim is certainly helpful. I used these tubes with my Michelin Pro4 Service Course and they work great together. The tubes are light and quite durable. I used these tubes for many years. 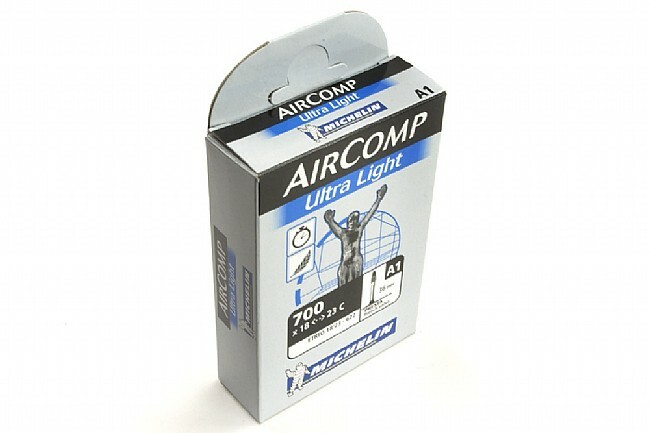 They are light (the most cost-effective way to take some grams off the bike) and reliable (I did not experience any more flats with these than with regular butyl tubes). I also like the smooth valve stems, which work better with the Silca pump heads. BUT , like many other cyclists, I have switched to 25mm tires, on wider rims, and may try 28mm next time I need tires. Michelin desperately needs to get with the program and release a 25-28mm version of this tube. I ride approx 2000 miles per year on mostly rural roads. I hate getting flats but sometimes ya hit some little piece of something and psssst...ugghhhh...l need I say more ?.... When i start the season with new tires and tubes these easily last the season. Been using Michelin Aircomps with Vredstein Fortezza TriComp tires for the past 5 or 6 years. I have been riding the Michelin A1B1 AirComp tubes on all of my 700x23c tires ever since I first discovered them about 12 years ago. The initial selling point for me was the smooth stem. I top off my tires before every ride and the threaded stems were wearing out the rubber gasket in the head of my floor pump. Sometimes I almost couldn't disengage the pump head and had to apply so much pressure I was afraid I was damaging the valve stem. The smooth stem AirComp makes adding air a breeze (no pun intended). The slight extra cost of the AirComp over other tubes is easily offset by the cost of pump head gaskets or, in one case, a whole new pump since I couldn't find a gasket. I have also found the AirComp to be very durable. If all goes well and I don't get a puncture from the occasional glass or nail, a tube will easily last through 2 or more sets of tires. This comes out to 6,000 miles or more. Been using these tubes for a few years. They are nice and light; rotational weight does matter. Don't get more flats than with heavier tubes. I also like the smooth valve stems.